Those of a certain age will have fond memories of devices that looked a little like this. Way back when, in the days before smartphones, folks had to use a PDA to get work done when they were out and about on the go. The form factor was typified by Psion, which died off at the turn of the millennium when it was clear other devices would take its place. But now the spirit of Psion lives on in a couple of its former engineers, which have developed the Gemini, a clamshell smartphone with a physical keyboard. 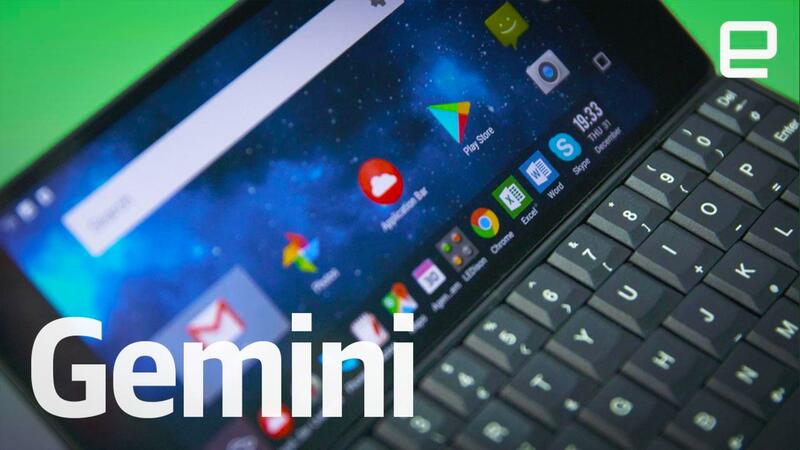 The Gemini comes packing a 5.99-inch FHD display and a 10-core MediaTek System-on-Chip paired with 4GB RAM and 64GB storage. That figure is expandable with the built-in microSD card slot, which can push that figure past the 256GB mark. And in that regard, it's pretty much a generic Android smartphone, albeit with the ability to dual-boot Linux and operate with a built-in keyboard. On the other side of the clamshell is the 4,220mAh battery and the aforementioned keyboard, which is as cramped and tall as you remember from the Psion days. The travel is certainly luxurious for a device of this size, but the distance between the keycaps is a problem. It may be an issue that you grow to overcome with practice, but I'm not sure my meaty, wide fingers are going to get any smaller, no matter how much I wish they would. Much like Samsung, and several other Android phones, the device can also work as a desktop, should you buy the additional accessories. Two USB-C ports on the phone can be connected to a USB and Ethernet hub and HDMI-out, enabling you to hook this up to a keyboard, mouse and external display. There are two options, a WiFI-only edition priced at $499, while a WiFi and 4G model will set you back $599. If you opt for the pricier model, you'll actually have to close the clamshell and speak into one of the sides to talk. Thankfully, much like Alcatel's latest phones, the devices are omnidirectional, with microphones and speakers at whichever end gets closest to your ear. Its founders admit that the Gemini is a niche device, but it seems to have found some love on Indiegogo when it was crowdfunded last year. The outfit managed to raise $1.3 million and is expecting the first orders to sail out of the door in the near future. At a guess, there's probably a whole generation of folks who miss the days of being able to organize their lives without having to tap their fingers on to glass.